A well-researched look at the resurgence of home life. Educated and progressive Americans are turning their backs on corporate life, writes Matchar, and moving toward a "more eco-conscious, family-centric, DIY lifestyle.” She feels this "new domesticity" trend is a "shift that has [the] potential to change the American cultural and political landscape." So why are more and more women and men embracing practices that our grandmothers used to do by rote and which our feminist mothers turned their backs on? Matchar examines the sudden uptick and interest in canning and preserving food, knitting, home-schooling and homesteading. Backyard chicken farms in urban areas, knitting and canning groups, and the explosion of blogs that provide minute details on how to live off the land are just a few of the arenas she explores. It seems many career-oriented women and men are simply not happy in their hectic, overly long days at the office and long for something simpler. Americans are tired of the rush and bustle of the ever-increasing work week, and many prefer to turn down high salaries in order to know the food they eat is from their own garden, the subjects their children learn are actually what they are interested in, and the local and global environments are better for their efforts. This new domesticity isn't necessarily a rejection of what the feminists fought for but a collaboration of old and new styles of living that embraces the best of both worlds—modern-day technology blended with the older wisdom of our pioneer forefathers and mothers, making a harmonious environment for all. 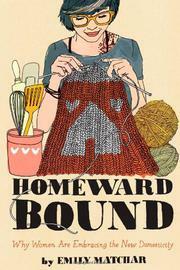 Offers intriguing insight into the renaissance of old-fashioned home traditions.